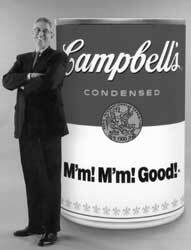 Doug Conant hopes to cook up a winner at Campbell Soup. Long before Doug Conant grew up to be director of strategy at Kraft Foods and then president of Nabisco Foods and now the president, director and CEO of Campbell Soup Co., he was a kid growing up in Glencoe, Ill., who liked playing tennis. He also liked dipping his grilled cheese sandwich into a bowl of tomato rice soup. Turned out the soup came from Campbell and the kid really liked the taste. Little did Conant realize then that he would one day be tapped to lead the revitalization of the world's most famous soup company. "Campbell's Soup is the ultimate food you remember from when you were a kid. We were all Campbell's kids at one time," says Conant, a 1976 alum, who became the company's CEO on Jan. 8 and is working to rejuvenate the company after several recent years of disappointing performance. Conant, 50, is no stranger to reinvigorating brands. His 25-year career in the food industry includes leading a turnaround at Nabisco during his five-year tenure as president, delivering five consecutive years of double-digit earnings growth. In the process, he led the reinvention of such core brands as Planters nuts and LifeSavers, and launched several successful new products, including SnackWell's. The Kellogg graduate now brings this proven track record to Campbell where he is implementing a paradigm for maximizing shareholder wealth that revolves around six strategic elements: revitalizing the core business; creating incremental "new" business; driving productivity with quality; accelerating technology; pursuing strategic breakthroughs; and driving organizational excellence to achieve all these objectives. "Often times when you encounter a business problem it's because you have strayed away from your fundamental mission and from your core capabilities in an unhealthy way," explains Conant. "Managers come up with these brilliant strategies, but if you don't have the competence to execute them, they can be your undoing," he adds. The pieces for Conant's personal success strategy arranged themselves early. Family life, he recalls, was always oriented around achievement and contribution to the community. At New Trier High School, Conant developed into a standout tennis player, a talent that would take him to Northwestern University on an undergraduate athletic scholarship. After earning his bachelor's degree in political science, Conant briefly explored the possibility of earning a living as a tennis pro before deciding to begin his business education at Kellogg. "Fundamentally, tennis is an individual sport," he says. "Early on, I realized that I wasn't good enough to go pro, but also that I hungered to be part of a team-based environment. The power of team-based culture was one of the lessons I learned at Kellogg that's been so helpful to me." Conant recalls being inspired by some extraordinary Kellogg faculty, including Louis Stern, Philip Kotler and Ram Charan. "Those professors had competence and character. They were a terrific set of role models," he says. Conant credits Kellogg for developing his appreciation of context, marketing and what he calls "the human equation." The CEO believes the Kellogg leadership experience has enabled him to understand how to excel in a team-based environment -- and how to create a culture that lets employees know they are valued. "Kellogg does a masterful job of creating well-rounded leaders," says Conant. "As students, we learned the importance of stepping back and analyzing a situation from 30,000 feet before dealing with it from two feet. We also gained a discerning market-driven mentality. Underneath all that, we learned that the secret to winning in the marketplace is about creating a superior employment experience in the workplace for your people." At Campbell, Conant's mandate is to transform the 132-year-old company so that it regains its place as one of the best performing consumer companies. He believes that, like any company, Campbell must meet and then exceed the expectations of its consumers -- and those consumers have changed with the times. People today demand more health-conscious foods, explains Conant, whose company also includes brands such as Pepperidge Farm cookies, breads and crackers, Godiva chocolates, V8 beverages and Franco-American canned pasta. In addition to wellness concerns, trends indicate that consumers are now demanding better quality and convenience as they balance a hectic work schedule with a demanding home life. The home/work dichotomy also produces markedly different consumer patterns. Soup is the No. 2 lunch item eaten at home, second only to bread, says Conant. Away from home, however, soup drops to No. 12. "That tells you there's opportunity for us," the chief executive explains. "If we can strengthen this behavior in the home and extend it away from home, on college campuses and in airports, for example, we can continue to grow our business." Conant has taken the top job at Campbell at a time of massive change in the food industry, highlighted by a wave of consolidations among major manufacturers and retailers. "Our industry is very Darwinian," he says. "As a company, you either evolve and grow, or you die. Given the choice, I choose growth every time."